What a great time in your daughter's life. Select a piece of fine quality jewelry that will always remind her of this special day and make it a birthday she'll never forget! 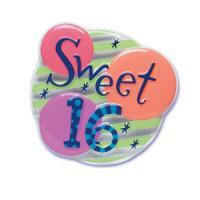 You'll have many significant birthdays in your lifetime – 1st, 16th, 18th and, of course your "golden" birthday. Birthstone jewelry symbolizes the month you were born and makes the perfect gift for whatever birthday your celebrating. A great gift for confirmation, first communion or any important event. We carry a wide range of styles from simple to ornate… traditional to contemporary. We have a huge selection of graduation ideas. It’s one of the great milestones in a young person’s life. A watch or piece of fine jewelry lets them know you understand their accomplishment. Charm bracelets are a unique way to express who you are. Select charms that tell the story of your life, and reflect your hobbies, interests and accomplishments!